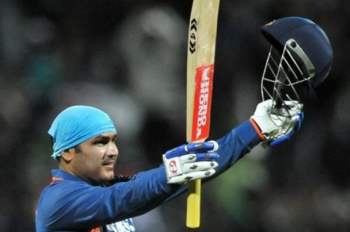 Sehwag 'Upar Cuts' Bangladesh for a Six! Bangladesh were probably hoping for a repeat of the 2007 World Cup. They had beaten India and knocked them out of the tournament. Back then they had bowled first and restricted India to a modest total. Similar thoughts might have been going through the Bangladesh team’s minds when they won the toss and put India to bat. Unfortunately they ran into Sehwag, who literally hit their hopes for a six. Sehwag score 175 runs of 140 balls. He also hit 14 boundaries and 5 sixes. Don’t you think he is the most destructive batsman ever? Do drop in your comments.